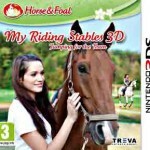 Tags: Dressage, Feed your horse, Grooming, Horse competitions, Horse farm, Horse jumping, Horse racing, Pony, Riding, Show jumping, Take care of horses, Train horse. 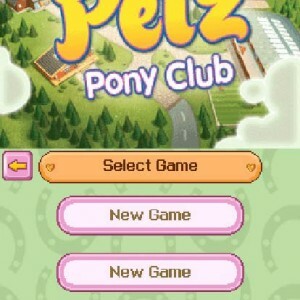 Be the proud owner of the new Pony Club in town! 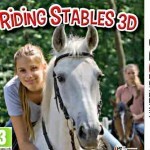 In this game, you’ll run your very own Pony Club in the city of Mareham. 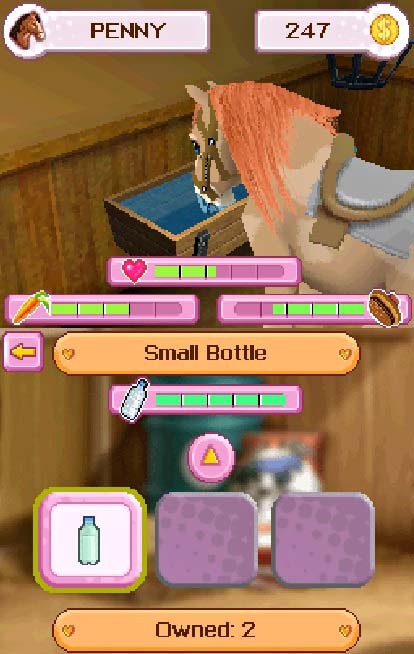 You’ll be welcomed by Jenny, the pony sanctuary owner, which will help you to get started in this new adventure. But first, and to prove that you deserve this opportunity, you’ll have to show that you are capable of cleaning the stables. This is one of the several responsibilities that you have to do around the ranch. The others include grooming the horse, washing and brushing it and cleaning its hooves. Be careful doing this, you have to be gentle because if you touch your pony’s head, he won’t like it! All these tasks are done by clicking and dragging your finger around the screen and sometimes feels a bit inaccurate but it’s still fun. 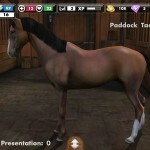 You’ll also have the opportunity of customizing yourself and your horse. Unfortunately the customization of your character is just choosing between some jackets but for your horse you’ll have several options. You can pick between 5 different colors or you can just create your own by choosing how you want that each part of the horse looks. After this, you just need to explore your club. Around the Pony Club, you’ll meet several people that eventually become members of your club and that pay you fee’s every time you make them a favors – that usually include training their own ponies. Some of this people are also useful when you need something. 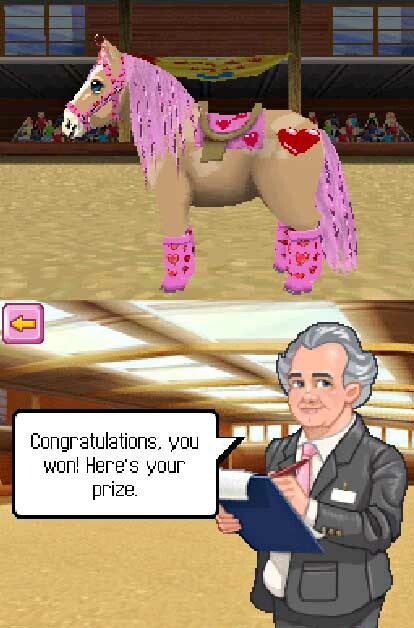 Like Brian that runs the Tack Store where you buy all of your accessories, vital for the fashion contests. 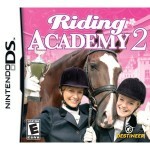 Besides this you also have competitions of dressage and show jumping. In Dressage you just need to repeat a sequence – like in the Simon Says game – and this gets a little repetitive and boring. 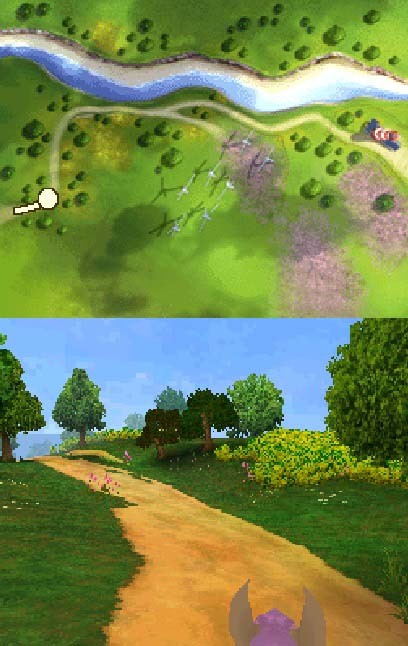 In show jumping you need to control the speed meter and jump when the game tells you to do. This isn’t also very appealing but unfortunately it’s how the competitions work in this game. 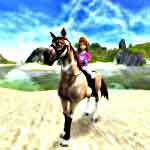 You also have a part of your ranch called The Bridge, where you choose to ride with your horse to a certain location. Unfortunately, I didn’t get the point of this part because the pony just walks very slowly in the middle of the woods and you basically just wait for it to arrive and then come back to the Club. To give something to the game, you also have several tasks to do but with time, they tend to get repetitive and that’s this game problem. To amuse you, you’ll have some beautiful cartoonish graphics with a lot of bright colors. 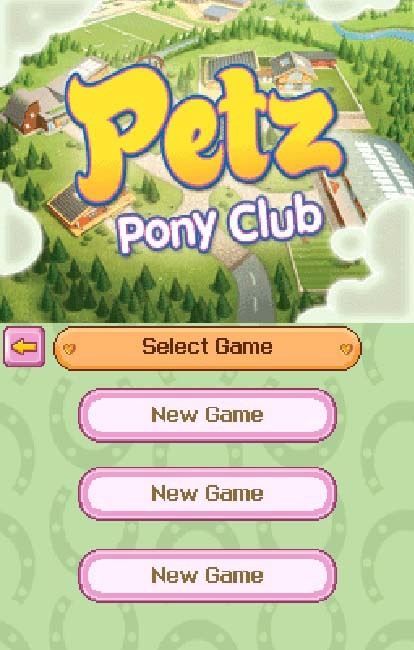 Although the animations, sounds and gameplay could have been a little more worked on, Petz: Pony Club is a game that little girls will love and have a great time with, but if you are a little older you’ll probably find it a bit boring.